The formation of stars in a wet merger is difficult to observe due to the large amount of dust that obscures the stellar nursery. Yet modern science offers astronomers tools that provide the most tantalizing glimpses of the baby stars. The birth of a new star is a rare thing to witness. Yet an international coalition of astrophysicists has discovered not one but many new stars emerging from a shelter formed by the collisions of colossal galaxies. Using the W.M. Keck telescope at Caltech as well as information gleaned from observations by the Hubble, Herschel, and Spitzer space telescopes, astronomers have been closely following the a cluster of 27 galaxies merging together. The cluster has been dubbed SpARCS1049+56. The formation of stars in a wet merger is difficult to observe due to the large amount of dust that obscures the stellar nursery. Yet modern science offers astronomers tools such as infrared and submillimeter wavelength telescopes that provide the most tantalizing glimpses of the baby stars. The mass of this cluster is unfathomable- more than the mass of 400 trillion suns combined. Scientists have calculated that the cluster is 9.8 billion light years from Earth. “The Spitzer data showed us a truly enormous amount of star formation in the heart of this cluster, something that has rarely been seen before, and certainly not in a cluster this distant,” said study co-author Adam Muzzin of the University of Cambridge, UK. To understand what is happening here, a little background on galaxies is necessary. A galaxy is considered to be any group of planets, stars, dust, gas, and dark matter held together by gravity. From what we know of the universe, there are three styles of galaxy. 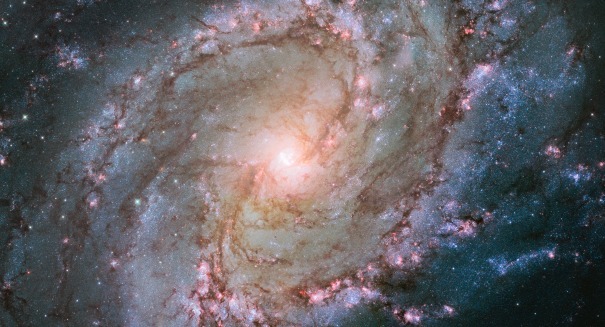 The most common form is a spiral, which makes up 77 percent of al known galaxies. Spirals have arms rich in matter that revolve around a dense stellar core. Many are still actively forming stars. Ellipticals are somewhat spherical galaxies that mostly contain only gas and dust. 20 percent of known galaxies are of this variation and they produce few stars. Irregular galaxies are rare and of varying shapes. They often contain many young stars. From time to time, spiral galaxies are known to collide with each other to create an elliptical galaxy. When the friction created by the combination of two giant gas clouds results in new star formations, it is known as a wet merger. No other wet merger has ever been observed to be so prodigious in its star creation.